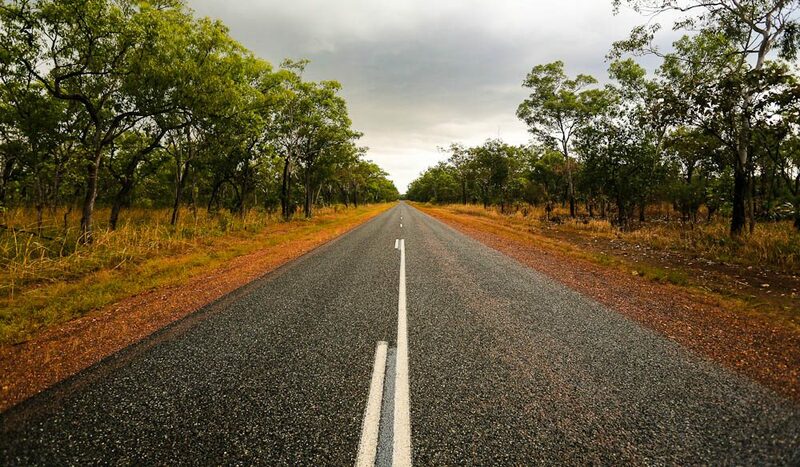 The best place for some uninterrupted family time, the open roads of the Northern Territory. When her parents arrive for a road trip, Jennifer Pinkerton gets a fresh take on family ties. My parents tip anxiously from foot to foot like pins standing at the end of a bowling alley lane. I approach the pick-up zone with caution. Their bags seem to house 50 wombats. Think oversized lumps choked by airport-issue tape. “There’s a reason these ‘heavy’ stickers show a picture of a man breaking his back,” I huff, lifting the load to the boot. “Should be a picture of you breaking your back,” Dad chortles back encouragingly. I’m not sure that’s funny. And we’re off. Five days. Me. Mum. Dad. And the road. It’s been over 30 years since the three of us tripped anywhere together. Sure, we’ve done stints along the way with my siblings and a carload of après-ski foot odour. But the trimmed down, adult version? Entirely new territory. Though I admit to quite liking the fact I have the driver’s seat this time. I expect the usual: homemade sandwiches, meandering conversation, inter-couple bickering and arguments over eating out (me = ‘yes!’ them = a resounding, rather killjoy ‘no’). I also know – for certain – that Dad will keep a hawk’s eye on my speed. The 130-kilometre per hour limit, standard for Northern Territory highways, is way out of his comfort zone. Sure enough, each time the needle creeps over 120, a sharp intake of breath sounds from the passenger seat. He throws in some white-knuckled handlebar gripping just for dramatic flourish. In these moments I pray he’ll fall asleep. But when he does, and the snoring arias start, Mum’s reaction is this. She puts down her knitting and, instead of rolling her eyes, she pokes her hand through his headrest and cradles his neck in her palm to stop it from bobbing. For the next 20 minutes she holds her position. He holds his. Um, when did they fall back in love? How could I have missed this? I smile at the long quilts of scenery rolled out before us. Inside Kakadu National Park, Dad springs to action. His elaborate ‘getting dressed for outdoor activity’ regimen is quite the scene to behold. Whether it’s a gentle stroll along a boardwalk, or a Bear Grylls-style journey into the wild, the man goes to town. On go the gators, high-top walking boots, socks pulled up to the knee, compass around his neck and full cover Antarctica-esque sunshades. As he heads off, Mum and I trail behind. A passer-by calls bravely, “Snakes won’t get you, mate!” Dad marches on, eyes fixed ahead. Mum looks unfazed. Later, I’m further behind. Mum is now up front. She and Dad trade botanical facts. “Is this a salmon-barked Western Australian eucalypt, Kerri?” he asks. “Most certainly is,” she chimes back. As they continue on, he poses her science-related questions – mum’s field of expertise. She answers each with interest. Their talk sounds like music: a bass with a treble. Our trip moves on and I pick up some new comfort rules for my folks. Mum gets tetchy without a nice morning tea and a sweet treat. Dad can’t function without mozzie spray – he’s sure we’ll all catch dengue. I get the predicted meandering conversations, plus bouts of bickering. But on, beside and away from the road, I also catch sight of my parents version 2.0. It’s a model that I’m less familiar with. One that’s tied together with friendship, the common things they love, as well as a calm acceptance of the other’s quirks. Long after our dirt-flecked car drops my parents and their even heavier luggage at the airport (crocodile-head gloves, anyone? ), a notice arrives in the mail. It’s a speeding ticket captured on the highway. I’d be angry, I suppose, if not for the photo that’s inside. There’s me driving nonchalantly. And there’s Dad in the passenger seat. His eyes are closed, his mouth is open. And if you squint just a bit, you can make out a shadow on his neck. It’s mum’s hand holding his head still. Is it weird to save a fine? I’m not so sure. But this is my new favourite travel shot. I’ll frame it with their ‘heavy’ stickers.